Fritz Lang was a German filmmaker in exile thanks to World War II. He saw making an adaptation of Graham Greene’s novel The Ministry of Fear as a way to contribute to the war effort and demonstrate his democratic credentials. However, the studio made changes to the screenplay that obscured many of the Nazi references, much to the director’s chagrin, for he was interested in making an anti-Nazi statement with this film. Stephen Neale (Milland) has just been released from a mental asylum and plans to go to London when he notices a rather festive-looking village fair off in the distance. After being cooped up by himself for a stretch, he’s eager for some human contact and decides to check it out. He encounters a palm reader who gives him a rather cryptic reading that helps him win a raffle for a cake – something that wasn’t meant to happen. Once on the train bound for London, he meets a blind man who’s not really blind. He hits Neale and takes off with the cake. Neale follows the man over atmospheric countryside at night right when the German air force is bombing a nearby munitions factory. Neale soon finds himself drawn into a shadowy underworld. 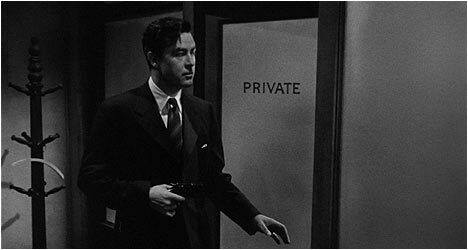 And with that enticing opening, Ministry of Fear (1944) weaves a paranoid web of deceit that ensnares its protagonist. After the mix-up with the cake, Neale can’t trust anyone he meets, from the phony blind man to two people claiming to be the same woman. Ray Milland plays the classic wrongly accused man role quite well. Initially, we’re not sure why Neale was in the mental asylum, but over the course of the film we’re given additional clues that it had something to do with the death of his wife, which makes him not an entirely the “innocent” protagonist he claims to be . Lang’s use of atmospheric lighting, especially during a séance scene is particularly effective. This sequence suggests something out of a horror film, while other scenes, with their urban London setting, hint at film noir. Ministry of Fear may have nothing more on its mind than telling an entertaining story and it certainly does thanks to Lang’s confident direction and the set and art direction which conveys the waking nightmare that Neale has found himself in. “On Ministry of Fear” features an interview with Lang scholar Joe McElhaney who talks about the film and puts it in the context of the director’s career. The author provides the backstory to the making of the film including how unhappy Graham Greene was with the adaptation. McElhaney gives us a bit of background to Lang and briefly examines some of the director’s themes.